Up Dharma Down is making major changes in 2017. 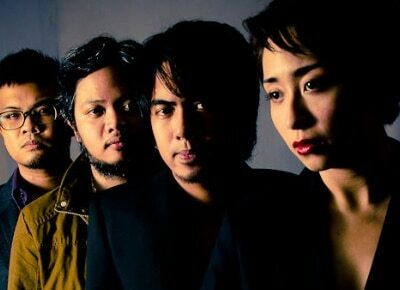 As Up Dharma Down release their newest single “Sigurado” this year, vocalist Armi Millare shared that she and her bandmates Carlos Tanada (guitars), Paul Yap (bass), and Ean Mayor (drums) are making a major change in 2017. "At a time like this, I earnestly feel that creative pursuits must be followed up with much caution and more love, because part of our job is to introduce moments of respite from current realities. Its just a few minutes of music but consider this us giving you our very best, and hope you enjoy it with your friends and family," she wrote in a Facebook post. "Goodbye Up Dharma Down, and hello UDD from the moment it is available on Spotify 12MN on January 1st 2017. Cheers to more music and to all the good things we can still experience and work hard for!" she added. 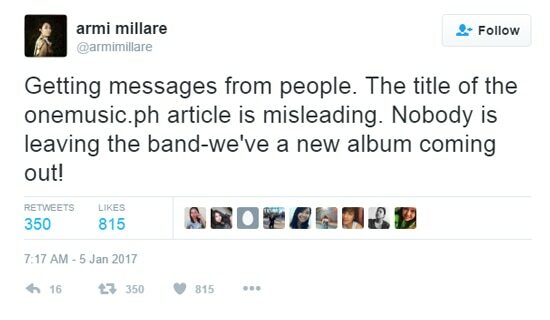 Armi also clarified that they aren’t disbanding.